Proof that mountain bikers can appreciate poetry. 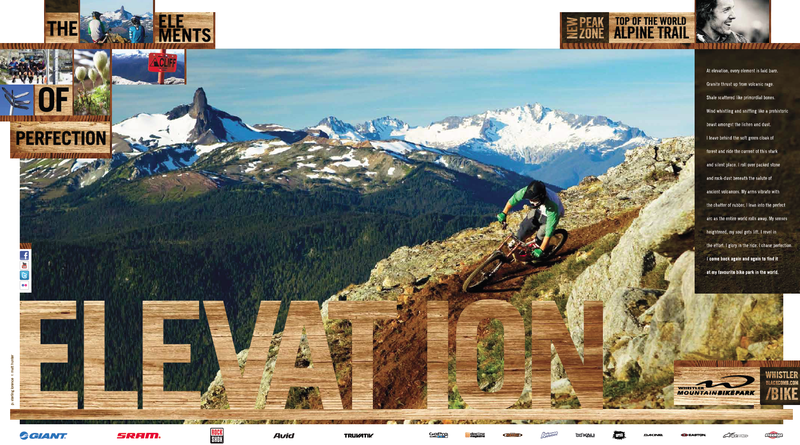 I was writing the copy for a series of ads for the Whistler Mountain Bike Park, that would pick up where last year’s Elements of Perfection campaign, written by Mike Berard and Origin Design and Communications creative director Danielle Kristmanson, left off. 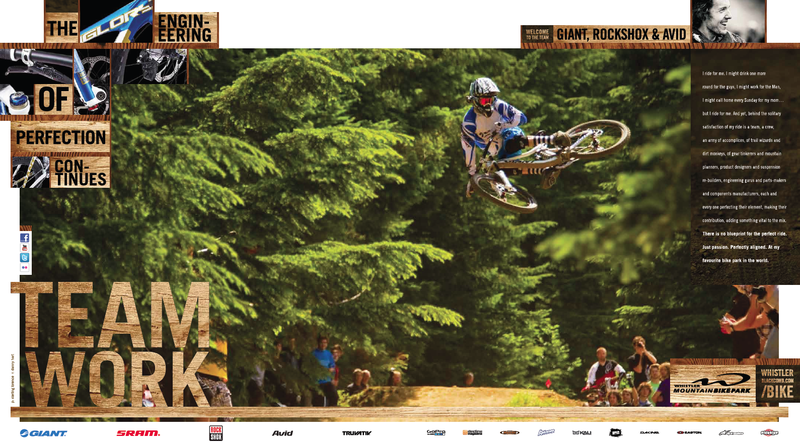 Instead of digging down to the primal elements of rock, dirt, root and air, that make up the riding experience at the Whistler park, the 2012 series of ads looks at more theoretical elements, like Team Work, Elevation, Dedication or Anticipation. And the guys at Whistler Blackcomb wanted it to be perfect. They could not have been more particular in their feedback than if they had been poetry editors. It was so fun to geek out on words in that way, and it showed me what respect the marketing and Bike Park crew at WB, like Mike Crowe, Darren Kinnaird, Rob McSkimming and Brian Finestone, have for riders. What they wanted to give them, was not so much an ad, but poetry. My colleague, Gary Martin, designed the ads beautifully. And I went hunting for the perfect words, to pin down the feeling of mountain biking in the Whistler Mountain Bike Park, in all its different guises. TEAM WORK. I ride for me. I might drink one more round for the guys, I might work for the Man, I might call home every Sunday for my mom… but I ride for me. And yet, behind the solitary satisfaction of my ride is a team, a crew, an army of accomplices, of trail wizards and dirt monkeys, of gear tinkerers and mountain planners, product designers and suspension re-builders, engineering gurus and parts-makers and components manufacturers, each and every one perfecting their element, making their contribution, adding something vital to the mix. There is no blueprint for the perfect ride. Just passion. Perfectly aligned. At my favourite bike park in the world. ELEVATION. At elevation, every element is laid bare. Granite thrust up from volcanic rage. Shale scattered like primordial bones. Wind whistling and sniffing like a prehistoric beast amongst the lichen and dust. I leave behind the soft green cloak of forest and ride the current of this stark and silent place. I roll over packed stone and rock-dust beneath the salute of ancient volcanoes. My arms vibrate with the chatter of rubber. I lean into the perfect arc as the entire world rolls away. My senses heightened, my soul gets lift. I revel in the effort. I glory in the ride. I chase perfection. I come back again and again to find it at my favourite bike park in the world. Next Post The poetry of mountain biking, part 2.